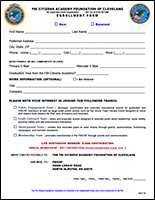 PLEASE NOTE: You must be a graduate of the FBI Cleveland Citizens Academy to qualify for FBICLECAAA Membership. Pay for your Annual Membership via Paypal (June to June). Subscribe for ANNUAL AUTOMATIC RENEWAL of your Membership via Paypal. $75.00 per year plus a $2.00 Service Fee will be charged annually on the anniversary of your first payment. Pay for your Lifetime Membership via Paypal. Or click the form above to download, print, fill out and mail in with your payment.